A prize-winning historian (Grand Expectations, not reviewed) revisits the 1954 school-desegregation decision and traces its effects on American social history. Patterson (History/Brown Univ.) argues convincingly that race remains at the center of many of America’s social problems and that “[t]he complicated issues that Brown tried to resolve in 1954 still torment Americans half a century later.” Patterson begins with a sad snapshot of American life before Brown, when the nation maintained a dual system of education for whites and blacks that kept the races separate and unequal(especially in the South. In the early 1950s, the NAACP and its principal attorney, Thurgood Marshall, decided to attack school segregation. Patterson humanizes Marshall, showing his playfulness, his doggedness, his patience, and—toward the end—his bitterness at the glacial progress of social justice. The author reminds readers that Brown was a constellation of cases, not a single one: the Supreme Court first heard arguments in 1952 but delayed ruling and ordered a rehearing in 1953. By then, Earl Warren was on the court, and Patterson shows how he worked skillfully behind the scenes to gain a consensus on the decision, which he delivered on May 17, 1954. Southern whites employed three principal strategies to deal with the decision (and with the 1955 order containing the now-classic phrase “with all deliberate speed”): violence, delay, and deception. Patterson argues that it was the civil-rights movement rather than Brown, however, that prompted the most spectacular advances (viz., the 1964 Civil Rights Act and the 1965 Voting Rights Act). 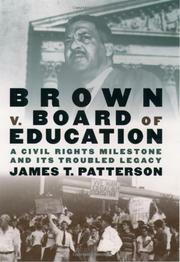 Patterson then chronicles the continuing efforts to achieve equality in education—with discussions of court-ordered busing, magnet schools, affirmative action, school finance, and the slow turn to the right taken by the Rehnquist court.